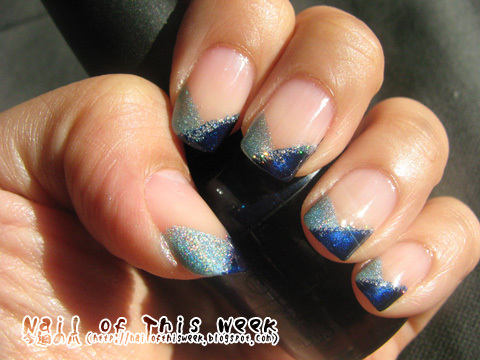 #013: Navy/light blue cross V-french : Nail of This Week. As my first post, I like this design, cross V-french by different colors, and I love this color combination too! It was a bit hard to do this by wide OPI brush so might be easier to do by the polish with thinner brush such as essie. This time I also used seche instead of essence, because I wanted to have nice thickness with glossy finish which looks like clear gel…I think it went pretty fine. Sooooo…I might do this again, but so much new polish release now! Every week I think if I might go for the new art or new polish, and as you know, it’s really a hard decision!